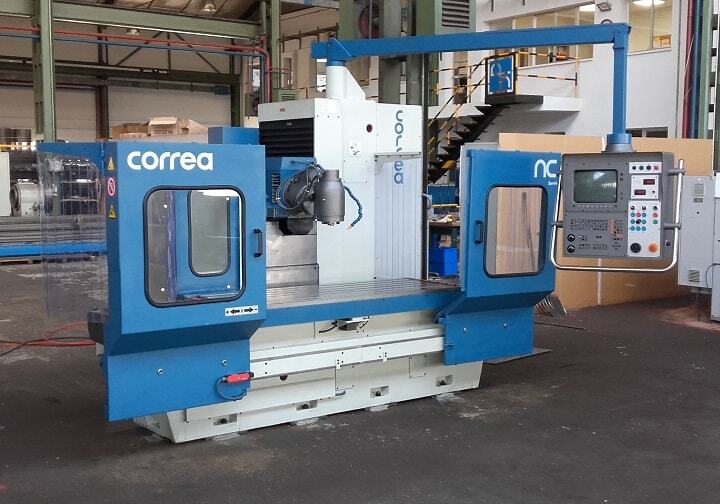 Following retrofit work performed by Nicolás Correa Service, S.A. on this second-hand CORREA CF20/20, this milling machine was finally sold and installed in early summer in a company in the region, with the NC Service guarantee of quality. This bed type CORREA CF20/20 milling machine, manufactured in 1996, offers a travel of 2,000 mm on its X axis and 800 mm on its Y and Z axes. Its features include hardened and ground steel slideways in conjunction with non-friction material counterslides on all three axes, in addition to a Heidenhain TNC-407 numerical control and universal manual head. This CORREA CF20/20 had already been retrofitted by NC Service back in 2014 for a leading English company in the automotive sector, which had opted for the technological upgrade and retrofit of a number of its CORREA milling machines, a task performed by NC Service at its facilities. This CORREA milling machine was then acquired by NC Service in 2017, when this English company decided to stop using this machine and to acquire machines with a greater capacity. Once at the NC Service facilities, the retrofit work included the complete disassembly of all the structural components, priming and painting, the replacement of bearings, the pre-loading of spindles on all three axes, the inspection and adjustment for the correct operation of the axle guides, the complete inspection of the manual milling head, and the disassembly and inspection of the electric components and CNC. The end customer for this milling machine was finally the Valladolid-based company PUTSCH NERVA, S.A., which is part of the German group PUTSCH®. In its search for the most suitable milling machine, this company opted for the quality of the CORREA brand and the expertise of NC Service in its retrofit work. This is what the company´s Technical Manager had to say, a few days ago: “When deciding on the purchase of a CORREA milling machine, there were a number of strong points in favour of this: firstly the robustness and good performance of our old CORREA machine, which has been operating for more than ten years now, and which we wanted to replace. We also valued the proximity of our factory to Nicolás Correa Service for after-sales service”. The core activity of PUTSCH NERVA is the manufacture of machinery for the sugar industry. The company also produces cutters for the glass window industry while it is also able to meet many other demanding requirements within the mechanical industry. The company therefore decided to withdraw its old CORREA A10 milling machine and to replace it with another machine with greater capacity and performance, finally purchasing the CORREA CF20/20. This company, which has a certified quality system and is committed to continuous improvement and to customer satisfaction and loyalty, considers the purchase of yet another CORREA milling machine, retrofitted by NC Service on this occasion, to be a clear commitment to quality and to good work.